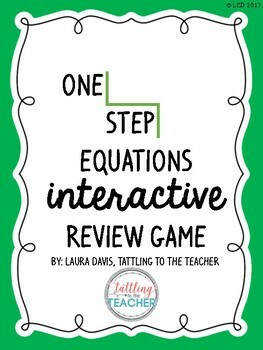 This fun, interactive review game reviews one step equations with addition, subtraction, multiplication, and division. *This game only includes positive numbers. 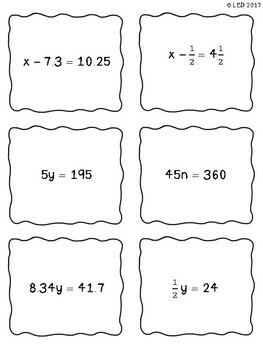 * The game challenges students to work quickly to solve equations and check in with a teacher before moving on to the next task. *The game was created for whole group, but could easily be adapted for small groups and centers. 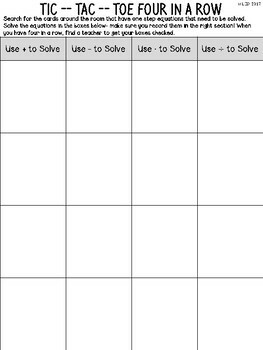 *The intention of the game is for students to solve 25 cards and keep track of their work on a grid: (4X4) and (3X3). 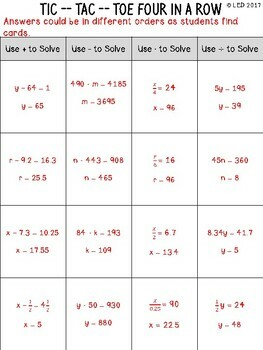 *This game should be used after teaching the skill of solving a one step equation. Feel free to email me with any questions, tattlingtotheteacher@gmail.com. Have fun playing!